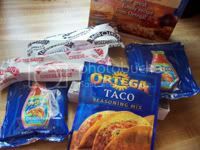 I try to avoid buying processed foods and mixes but I’m a sucker for a good bargain, so that’s how we ended up with a couple of boxes of Mexican Pizza kits. We saw them on sale at Costco for 99 cents a box. Who can resist a sale like that? And since when do you find anything priced at 99 cents in Costco where everything comes in bulk and costs an average of $10? There were two pizzas per box, so I figured I’d get two boxes and have enough. It was more than plenty. We still have the second box and will probably end up tossing it. Why? For one, the crunchy tortillas that came with the kit were stale. 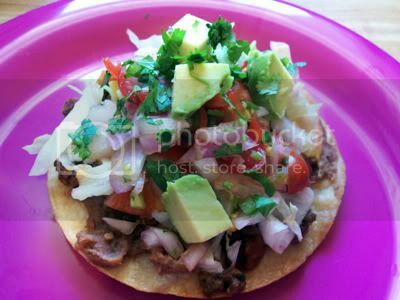 We ended up making our own by frying fresh corn tortillas. The seasoning packets that came with the pack were bland. Why am I not surprised? We ended up seasoning up the ground beef our way and making our own salsa. Basically, we ended up making the whole thing from scratch anyway. lol! So what did we get out of this kit? 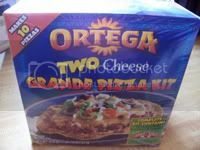 The IDEA for making Mexican Pizza! Mexican Pizza is very easy to make, really, it’s like tacos or nachos flat on its back 🙂 The pizza above was topped with refried beans, spicy ground beef, cheese, homemade salsa, lettuce and avocado. Now that $2 idea was delicious!